Desley Anne Finedon is the beautiful, tall and elegant wife of a man called Rex, however before Rex was fortunate enough to marry the love of his life, Desley had her own story. Desley was born in Brisbane on March 23, 1941. She came from a typical Australian family, of five children and two parents. Desley lived in Brisbane until she was six years old, her family had to relocate to Hobart Tasmania due to her father’s new job as the commissioner. Desley grew up with a Christian family background, which involved her family going to church everyday and so on. She was fortunate to grow up in a loving family and enjoyed undertaking activities that she loved such as sports and participated largely in her school community. “I loved sports, and was head prefix in high school. I also represented Tasmania for high school netball in 1958 at the age of 16,” she says. After completing school, Desley went on to become a nurse and completed her general nursing in Tasmania. She then relocated to Victoria in order to study midwifery at the Queen Victoria Hospital. 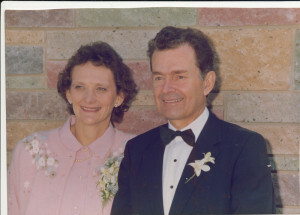 In 1964 Desley went to study the Bible at the Melbourne Bible Institute, where she met her future husband Rex. “Rex and I met in 1965 at my first year of Bible collage, and it was Rex’s last year of Bible collage at the Melbourne Bible Institute,” she says. After completing her time at Bible study, Desley became a midwife nurse and worked within children’s health. Rex Finedon, was born in New South Whales in the year 1940, he grew up with four siblings and one half sibling. His parents divorced when Rex was nine. Rex’s father was from an average Christian faith and his mother was an atheist. When Rex was 13 years old, his father married another woman that was when his stepmother became a new part of their life. Due to his broken home, Rex had dropped out of university after studying a Bachelor of Science in the first three months, regardless of how bright he was as a student, he felt as though university wasn’t for him, he then went and got his first job at Peter’s Ice-cream. Although Rex had a lot of ups and downs with his life he still remains optimistic thanks to God’s guidance. Rex was a welfare representative in the army, he spent eight years with Campaigners of Christ in the army, Seven years here in Australia, and one in Vietnam. Rex and Desley Finedon were two ordinary people living their own lives, however with God’s guidance as they describe it, they became one. When they first met, it was Rex’s last year at the Bible collage, before he joined the Campaigners of Christ organisation linked with the Australian Army. At this point in time Rex stayed in contact with Desley through letter writing, as she continued with her studies at the Bible Collage. Rex said even when he was in Vietnam they wrote letters to each other every single day. “It sometimes took weeks to receive a letter. That is so different to Snap Chat, because you sit down and think about what your writing unlike Snap Chat where you just take a snap for 10 seconds and send it,” he says. Rex and Desley’s friendship developed into something greater, although Rex had other girlfriends prior to meeting Desley. “I did have girlfriends before I went to Bible collage but I promised God that I’d do what he wanted me to do, I was first engaged at the age of 22”. As Rex’s faith grew stronger, he knew what God wanted him to do and that was to marry the woman chosen for him by God, Desley. “I left my job at the army in Singleton to go and ask her to marry me, without letting my boss know, I ended up getting in so much trouble,” he says. However, before asking Desley to marry him, Rex made sure to ask her parents for permission to marry, as it was the respectful thing to do, as well as it being the tradition. Rex and Desley married in 1967, the newly weds were both in their mid twenties when they chose to wed.
“I was married at twenty-six and had my first baby when I was twenty-seven years old,” Desley says. While Rex was in Vietnam not long after their marriage, his job was consistent of taking care of the soldiers before and after they had to fight. “I ran a recreation facility where soldiers could come play table tennis and games, I had a fridge where they came and had cold drinks and I got them to send flowers back home to their loved ones,” he says. Rex shared memories of when he used to carry an armed weapon at all times in Vietnam, as it wasn’t safe regardless of his job as a welfare representative. While Rex was in Vietnam, Desley had to go back to live with her parents in Tasmania where she had her first child. “I went back to live with my parents in Hobart while Rex was gone, “she says. As Rex stayed in Vietnam, he missed out on the birth of his first daughter. It was a tough, for his small family. Rex did not have the opportunity to see his newborn child until she was nine months old. “ I came home to a nine-month old baby that didn’t know me,” he says. As Rex and Desley’s family grew bigger, Rex continued working away from home, living at different bases for the ministry, making this hard on his family. Rex found it difficult to get a job until he completed his Diploma in Theology and Religious education while he continued expanding his family to four children. Rex and his wife Desley strongly believe that God is the foundation of everything, which is their children, marriage and life as a whole. With Rex and his wife strongly believing in the Cristian faith, they give advise on their view of the meaning of marriage. “You take marraige very seriously as Christians; you know it’s going to be for life and when you want to serve God make sure you marry someone who is going to support you in that desire that God wants you to do,” he says. Rex went on to become a religious education teacher in schools including the Toowoomba region. He also developed a passion for working with the African community. Rex has been largely involved with the African community in Toowoomba, where he has played a father figure role to many of the young men. He is also always present at many special community events such as graduations, churches and Independence Day celebrations, as one of the community elders. Some of his duties included teaching the men how to drive, driving people to church and assisting with handy work in people’s homes. Rex was recognized for his hard work within the African community in 2011. He was elected by the African community to win the Premier’s Awards for Queensland Seniors. He won the Premier’s Award with pride. He also received an award of appreciation from the South Sudanese community in 2011 during their Independence Day celebration for his contribution to the community. Rex now runs his own driving school business, which is a great help to many in the community.